BetAmerica.com is one of the few online betting sites in the world that is licensed to do business in the United States. That’s right, this is a legal betting site located on US soil and serving customers inside the US. How is this possible, you ask? It’s because horse and greyhound racing specifically received exemptions from all past legislation regarding “unlawful” internet gambling. As the name suggests, BetAmerica is a US-licensed and US-focused betting website for horse races, greyhounds and fantasy sports. A flawless reputation for security and fast payouts makes this a worthy option for the discerning gambler. The company is licensed by the Oregon Racing Commission and is able to accept customers from most US states and other parts of the world. What they have to offer is real money betting on greyhounds, horses and even fantasy sports. All wagers are pooled with local tracks and that means bigger payouts for everyone. BetAmerica was founded in 2008 and has since grown to become a respected place for real money racing betting. You can sign up for an account, make a deposit with your credit card and start wagering on races today. You’ll also get a nice welcome bonus added to your first deposit. All new customers to BetAmerica qualify for a first-time deposit bonus. After you sign up for an account, BetAmerica will double your first deposit for up to $100 extra. Deposit $50 and you’ll get an extra $50. Deposit $100 and you’ll get $100 on top of that. It’s that easy. When you get the bonus, the extra money will be placed in a “pending bonus” account. It is unlocked at a rate of 10% for every bet you place. So what this means is if you place a $10 bet on a race, $1 of the bonus will move over to your real money account. This continues on until you have cleared the full amount. You have one full year to release the entire bonus. BetAmerica also hosts a constant stream of bonuses for existing players. The bonus changes every month but it’s always something good. At the time of this review, they were offering 9% cash back on all fantasy sports bets, free exacta wagers for horse races, 10% added to all winning trifecta wagers and additional reload bonuses if you bet on certain big events. It’s always changing so you’ll need to check the “bonuses and promos” section of the website to see what they have on offer right now. There are four major forms of betting available to all customers of BetAmerica. These include horse racing, greyhounds, fantasy sports and “fantasy games” which allow you to place wagers on a variety of pop culture events such as the Grammys, Oscars and other things of that nature. However, BetAmerica.com was a racing betting site at the beginning and that’s where its focus remains today. Horse racing is where BetAmerica really shines in my opinion. They cover more than 200 tracks from around the world with all the same wagers that you could place in person at the track. In fact, all bets you place are pooled with the wagers placed by the people actually at the track and you get paid full track odds on all winning wagers. Thoroughbreds, harness racing and quarter horses are all covered. You can bet on all the local track events that don’t make the news as well as major events such as the Kentucky Derby, Preakness Stakes, Belmont Stakes and Breeders Cup among others. BetAmerica’s coverage of greyhound racing is equally thorough. You can bet on every race on nearly 20 tracks across the United States. These include all the major races as well at least a hundred smaller races every day. And also like horse racing, your bets on dogs are pooled with the wagers placed by those in attendance at each race. You can watch the race in real time and place bets just like anyone else at the track. The types of bets you can place include win/place/show as well as the exotics, keys and wheel bets. It’s a thorough greyhound racing experience every time. Fantasy sports were added to BetAmerica in 2013 and have proven to be a popular addition to the lineup. Fantasy sports betting resembles traditional sports betting except it’s done with a fantasy draft just like you would play with your friends. Also, each contest only lasts a day instead of a whole season. This form of betting is also exempt from anti-gambling laws passed in the United States so it’s completely legal. In fantasy betting, you either face off against a single opponent or join a tournament style matchup. Each person gets a play-money draft salary to pick the best players for their team. As your picks play in the real world, you earn points in your fantasy draft world. Whoever ends up with the most points at the end of the day wins the pot. Fantasy games are set up in a similar manner as fantasy sports but they cover events other than athletics. For example, they have a game running right now in which you and other players pick celebrities as a part of your fantasy draft and win points based on how active your celebrities are on Twitter. Other options are coming soon as well. Eventually, you’ll be able to bet on events such as the Grammy and Oscars and current events. 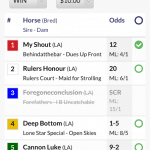 This aspect of BetAmerica is still a work in progress but it looks very promising so far. BetAmerica entered the online sports betting business in early 2019 for customers located in New Jersey at first, but with plans to expand to Pennsylvania and other states as legislation permits. BetAmerica.com still has its complete horse racing platform available to customers in most states (see our list of accepted states below), but actual sports betting is still restricted in most states. However, parent company Churchill Downs has confirmed BetAmerica Sportsbook will be expanding in time as legal sports betting spreads across the US. BetAmerica also offers in-play betting with live events covered every day. For the unfamiliar, in-play betting allows customers to place short-term wagers during games with odds that are updated in real time. In-play wagers can involve everything from betting on who will win the game to what the next scoring play will be – all offered in real time. 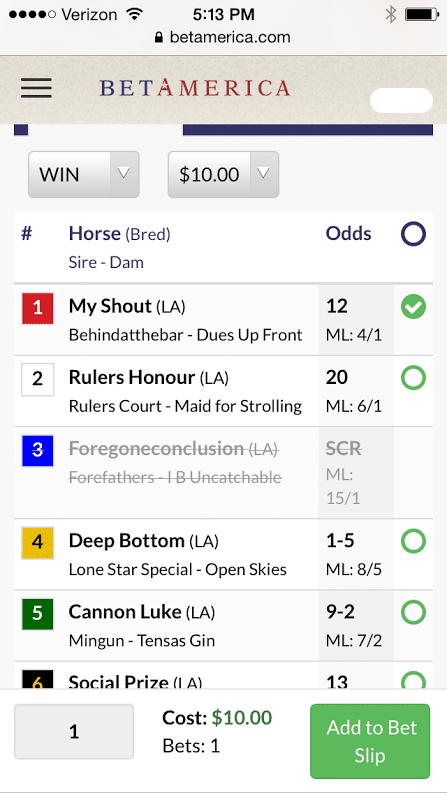 In all, BetAmerica.com can be considered a complete betting site with sports, horse racing, mobile apps, live stats and more all offered in one place. You can head over to BetAmerica.com to check it out today. BetAmerica.com does more than offer betting. The website has a whole host of other features that come together to make for a well-rounded experience. Here’s a look at a few of the additional perks you get as a member. You can watch the races live on your computer with an account at BetAmerica. The best part of all is you don’t need to have a certain amount of money in your account or an active bet on the race. A free account grants you access to live video. You can watch the races in real time right on your screen. 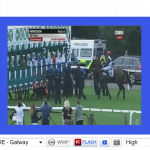 For those of us who don’t have access to horse racing on TV, live video online is a huge bonus. You can tune in on the website and watch your bets play out in front of your eyes. You can log in to your account any time to watch both horses and greyhounds. The website is loaded with handicapping tips, past results, a large handicapping guide and even a handicapping “night school.” An account also grants you free access to the ProPick Racing service run by handicapping veterans Gary Smith and Richard Eng. 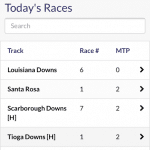 Their bets are listed for free and you can bet on the same horses and same races if you wish. This is one of the advantages offered by parimutuel wagering. You don’t compete against BetAmerica like you would at a normal sportsbook. They get their commission no matter who wins or loses so they have no problem giving out free picks and expert advice. Point your iPhone, iPad, Android or tablet to www.betamerica.com and you’ll go straight to the mobile version of the website. It’s not an actual app you can download from the iTunes Store but it functions very well nonetheless. 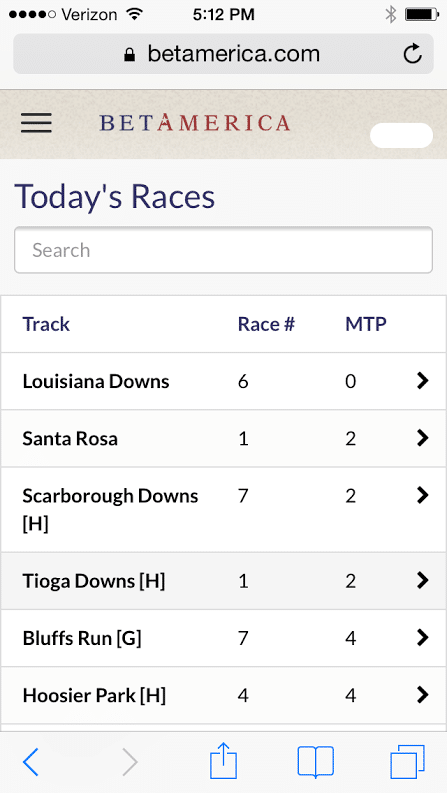 The mobile app allows you to manage your account, place bets on races and even watch live racing feeds. Here are a couple of pics I took from my iPhone just now. Just click on either one for the larger size. Since BetAmerica is fully legal in the United States, you don’t have to jump through the same hoops you do at other unlicensed offshore gambling sites. The deposit methods here are easy to use and work quickly. If you decide to make a deposit, you can do it with your Visa, MasterCard, American Express or Discover card. Other options include the Green Dot MoneyPak and Vanilla Reload which are both prepaid cards that you can purchase with cash at your local Wal-Mart or pharmacy. BetAmerica can also take e-checks. Choose this method and type in your bank account number plus routing number and complete your deposit. Finally, they also accept wire transfers which are excellent for larger deposits. Cash deposits can be made at any participating 7-Eleven or Family Dollar via PayNearMe. If you log in to your account, visit the cashier’s area and choose PayNearMe, BetAmerica will give you a payment code that you can take to the nearest 7-Eleven or Family Dollar. They accept up to $500 in cash deposits per day with this deposit method. BetAmerica recently added PayLucky as a deposit method for instant credit and debit card payments. PayLucky is nice because it has much higher success rate due to PayLucky being owned by the world’s largest credit card payment processor (First Data). If you have had issues with blocked credit card deposits, you may want to check and see if PayLucky is available to customers in your state of residence (just log in to BetAmerica and visit the cashier to see which options are available in your area). Below are the states from which you CANNOT use BetAmerica. However, it should be noted that you can still play fantasy sports at BetAmerica in all of the following states except for Arizona and Washington. Note: Different racing betting sites have different state restrictions. Each site must go through state-by-state to get the approval to offer services to its residents. If you live in a restricted state, you can try a different betting site and you might just be able to play there. All-in-all, BetAmerica comes highly recommended from myself and everyone I know who bets on horses. This site is a prime example of how well-done online gambling can be when the state eases its restrictions. BetAmerica is safe, the wagers are fair and winnings are paid quickly. You couldn’t ask for anything more from a betting site. Update: BetAmerica was purchased by Churchill Downs Inc. in the first half of 2017. There have been no major changes so far apart from a few changes in state restrictions for customers, but we believe it is in the best interest of our readers to note whenever one company buys one of its competitors. 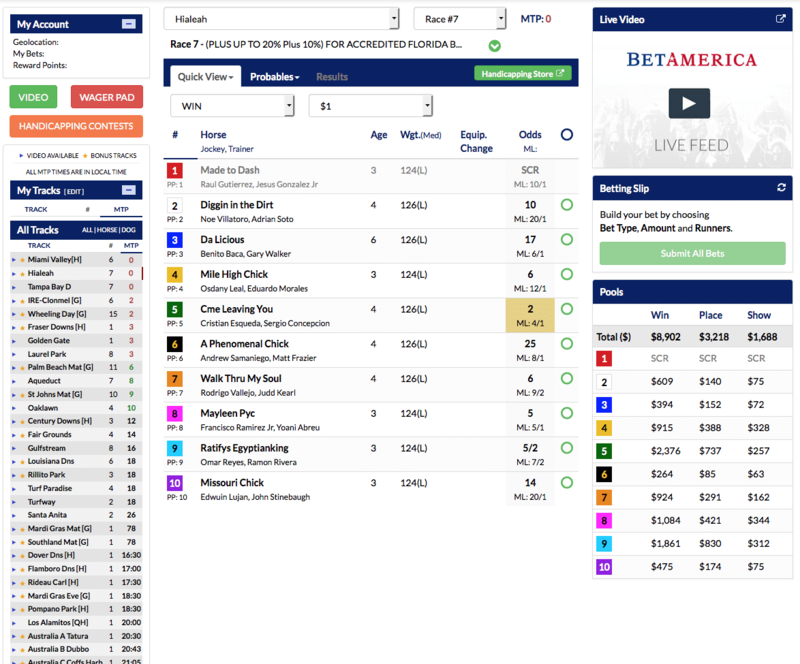 BetAmerica and TwinSpires are now owned by the same parent company.